Few tacticians give the defense its due. But for the record, history does. The slaughter of Union troops at Fredericksburg, Virginia; the massive carnage of Confederate forces at Gettysburg, Pennsylvania; the unimaginable horror at Ypres, France; and the wasting of a million Chinese lives along the 38th Parallel between the Koreas. All of these examples illustrate the effect of a well-managed defense. On occasion history records the devastation of the offense, too. By and large, however, the worst days of carnage in the human existence have come from well-organized defenses. A logical argument would state that what is true in military history should be reflected in military simulation – but that is so rarely the case. How did it come to this? What factors contribute to the myth that the offense is the stronger tactic, and how do these myths impact wargaming simulation? Yes, these questions are the basis of a doctoral dissertation and I’ll save you the lengthy reading. It might be best boiled down to “conviction of purpose”. That is, because the offense requires the expense and resources to mobilize and project a military force, it appears that military gamers assume the greater conviction of purpose should be awarded to the offensive force. At the same time, an inverted argument is applied to the defensive force – namely that because the defense does not mobilize and project itself, the conviction of purpose for the defense is low. These assumptions stack the card just a bit at the higher echelon of planning and wargaming. But a similar set of assumptions occurs at the small unit tactical level. After all, who comes out to a Saturday game wanting to sit in a muddy trench while it’s raining? Right! We came to fight and we’re going to go find a fight! Again, the conviction of purpose appears to belong to offensive action. It’s a shame, really, when a victory is often lost for want of just sitting still. Let’s be very clear on this. The defense has no intrinsic value. That is, the defense is not executed as a final state. There is no “perfect defense” because humans are smart and will, in time, figure a way around or through your defense. That means we must seek to impose our will upon our opponent, and this is only achieved through offensive action. So the defense is assumed in order to (1) allow time to build a larger friendly force, and/or to (2) wear down the opponent by allowing them to be destroyed in the defenses carefully prepared engagement areas. Both of these purposes have the focus of increasing the friendly-to-enemy force ratio. The theory is fairly straightforward. Its application is quite another matter. As stated earlier, the troops simply don’t want to sit still long enough for the defense to be effective. They didn’t come out to play MILSIM by sitting on their laurels! Here is an opportunity where effective leadership comes into play. Set the troops’ expectation. It might be just that simple. From the onset of the mission, explain that the mission is defense. Explain what is possible – victory. Furthermore, explain that only after the enemy force has been wasted on your brilliant defense will the troops get the opportunity to finish off the opponent with an equally brilliant assault. Show them the plan and then rehearse it. Be sure to rehearse the transition to offensive action so that your troops see exactly how they will envelop the retreating enemy and defeat them in their routes of egress. Keeping the troops motivated is critical to the defense. This means keeping the troops informed! Furthermore, if your defense requires more than two hours to hold (and most do) then be sure to manage your resources effectively. No troop can be expected to remain diligently searching the landscape for more than two hours at a time. Heat, cold, insects, rain, hunger, exhaustion all play heavily on fatiguing the defenders and it’s only a matter of time before the troops stop paying attention to their front. That’s not bad soldiering; it’s poor leadership. Take into account the experience and exhaustion of your troops to calculate the time that they can be expected to effectively maintain watch from a static position. Typically this is an hour, but no more than two hours. Now multiply that times three shifts. The defense is essentially broken into three shifts or areas of responsibility. This includes the line, screening patrols forward of the line, and the reserve force. Plan on dividing your defense into three equally sized shifts. The line occupies and maintains all essential positions along the defensive line. This includes command positions, crew served weapon positions, observation/listening posts, and enough rifle positions to adequately defend the line. Don’t assume that every position needs to be occupied. In a sustained fight, these positions will likely be reinforced by the reserve force or returning forward patrols. The screening force patrols forward of the line. They serve to deny access to enemy reconnaissance teams and to conduct spoiling attacks on massing enemy forces. 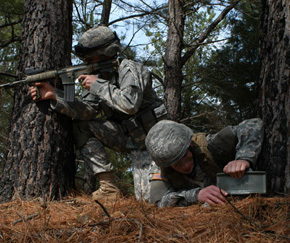 The screening force acts as advanced notice of enemy activity. This activity gets the troops moving periodically. Patrolling is invigorating. It serves the individual troops in obtaining a broader perspective of the battlefield, and updates the commander’s situational awareness. But again, we can only expect the troops to patrol for a couple hours before becoming exhausted. They need rotation, too. The reserve force is perhaps the most critical part of the defense. 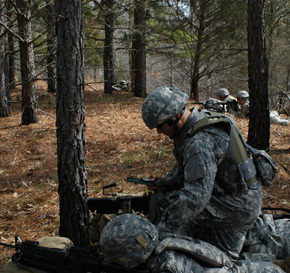 The reserve force can fill a gap in the line to bolster the defense; it can occupy secondary or alternative defensive positions in the event the front line is faltering and needs to withdraw; and the reserve force can transition quickly to offensive action and envelop a repelled enemy force as they attempt to escape through their routes of egress. Because the reserve force is so critical to an effective defense, it is typically located just behind the line, out of sight of enemy reconnaissance teams. What’s more, unlike the line and the screening patrols, the reserve force really doesn’t have much of a job until the enemy attacks. This makes it ideally located and suited to rest the troops. As a reserve force, the troops can eat, sleep, clean their weapon, and brush their teeth – the mundane things that hinder them from being effective on the line or on patrol. So the routine is set. A couple hours on the line, a couple hours on patrol, and a couple hours of rest as a reserve force, and the defense is effectively managed. After a few days on the front line, another friendly force typically replaces the entire unit so that it may retire to the rear security areas and more adequately rest, plan, and re-equip. So proper management of the defense is its greatest advantage? Yes, in a sense. A defending force with a unifying conviction of purpose, a plan to affect that purpose, and a rotational cycle that permits the force to carry on are arguably the most important characteristics of the defense. This is not to diminish the importance of interlocking sectors of fire that make use of terrain to slow the approaching enemy in prepared engagement areas. Synchronized combat power and an excellent communication and logistical plan are paramount. All too true. Yet for all the gadgetry and wonderful positioning of the defense, it is all for not if the troops are exhausted, poorly managed, and uniformed. To recap, the defense is used temporarily. The intent is to obtain a favorable friendly-to-enemy force ratio either through reinforcements or through attrition of the opponent’s force. Once a favorable force ratio is achieved, the defense must transition to offensive action in order to impose will. But it is this “in between time” – the time the friendly force assumes the defense that is so critical. Poorly managed defenses simply fall apart. Effectively managed defenses have been recorded by history as being agents of wholesale devastation! NextNext post:Worst Case Scenario: Outnumbered Assault!